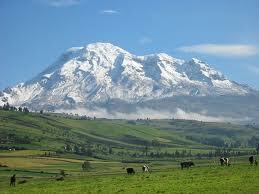 Trueda and I will be in Cuenca, Ecuador for ten days in January. It’s a boots-on-the-ground scouting trip to decide whether we want to live there for a while. When I retire, which is still a ways off but close enough to start thinking about, I won’t want to start Social Security right away. I will want to let it “age” a few more years to increase its lifetime value. This is because Trueda and I were late to the retirement savings game, so we need to maximize the Social Security part of the equation. That leaves us with a gap in which we will have to live off our savings. In order for the math to work out in our favor, we have to minimize our expenses during that time. America is an expensive place to live, but it turns out there are many places in the world where the US dollar goes a lot further than it does in the States; countries where you can live comfortably on much less than a comparable lifestyle would cost in America. We did our homework, and narrowed our search down to Oaxaca (wah-HA-ka), Mexico and Cuenca (KWEN-ka), Ecuador. Cuenca looks like a better choice for our initial “Expat 101” experience of, say, six months. So we’re taking a vacation there to check it out. Ecuador is a developing nation. It is generally as safe as the USA. It is a stable socialist democracy. It has a stable economy. Virtually the entire country has internet. Excellent health care available in the cities. There are very few creepy crawlies above 8,000 feet in the Andes Mountains. There is no significant terrorist presence in Ecuador at this time. It was Trueda who first suggested the idea of retiring early and moving to one of several possible retirement destinations around the world, such as Ecuador or Costa Rica. This was in response to one of my occasional lamentations about how far off in the distance retirement seemed to be, when I could move on to my next career as a writer. She had been reading about how some Americans are retiring to other countries where the cost of living is significantly lower than it is in the States. My first thought was, “Ah ha! A way to get off the endless hyper-speed treadmill that is slowly sucking the life out of me.” It didn’t take us long to realize that there was more to it than that. This was an invitation to an amazing adventure. This was something we could do quite apart from my desire to stop working for other people. It was an invitation to explore new places, to meet people who lived differently than us and viewed the world differently than we do, to learn a new language, to taste new foods and smell new smells. To see the world through other eyes. What an incredible journey, outward and inward. How could we not do this? We came up with a list of things that are most important to us, with the first six being non-negotiable. Then we researched a dozen potential retirement locations that met our criteria, and scored them, which gave us a relatively objective way to compare them with each other. Which is how narrowed it down to Oaxaca and Cuenca. 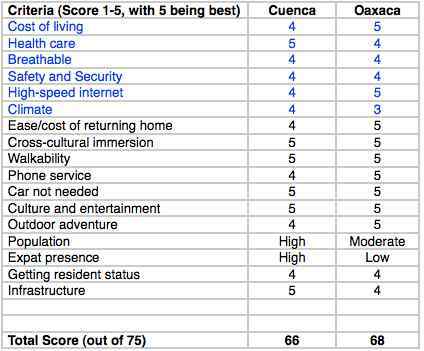 Oaxaca scores slightly higher than Cuenca, but it has a low expat presence and English is not commonly understood there. Cuenca, on the other hand, has a large and friendly expat population, and has many businesses that cater to English speakers. It also has a reputation for being one of the best place in the world to learn to speak Spanish. We might end up living in Oaxaca someday, but we have decided that Cuenca is the better choice for complete newbies like us to find out whether the expat life is for us. Let’s look at Cuenca more closely. First up is low cost of living; we want to keep our costs at a minimum because we will be drawing down our savings to cover it. It is possible to live in Ecuador for under $1000 a month (no, that is not a typo). It would be tight, but there are expats there doing it today. A comfortable lifestyle would come closer to $1500 a month. A relatively luxurious lifestyle, certainly better than anything we could afford in the States, can be had for $2000 a month. Definitely affordable, with some left over to cover one-time expenses, like moving and initial household setup, and a couple trips back to Vancouver, BC to visit family each year. What about health care? Ecuador is a third-world country, and its health care system reflects that, especially in the rural areas. But in the cities, world-class health care is easily available and surprisingly affordable. I compared the cost of a gall bladder surgery in Cuenca without insurance, with the cost in the States with Medicare. The out-of-pocket cost in Cuenca was the same as the out-of-pocket cost in the States after Medicare, including the hospital stay. Many expats in Ecuador choose not to have health insurance at all, and pay for all their health care out-of-pocket. We’re not that adventurous, and will most likely purchase a high-deductible policy for catastrophic medical expenses. The third non-negotiable on our list is breathability. By that I mostly mean altitude and pollution. Trueda is allergic to half the substances known to man, and has asthma. We don’t want to live someplace that exacerbates those conditions. Cuenca has some pollution from all those old diesel buses, but it is pretty much limited to El Centro (the downtown area). The other factor affecting breathability is the altitude. At a mile and a half above sea level, altitude sickness becomes a serious consideration. Most people adapt after a few weeks; some never do. We’ll just have to wait and see on that one. Safety and security is high on our list of concerns. Ecuador does have crime. Especially in the cities, including Cuenca. But you have to put it in perspective. Cuenca is overall safer than many similar sized city in the States. The main thing is to be aware of your surroundings and to avoid known dangerous areas. The same thing is true in any American city. In fact, we were surprised to discover that the good ol’ USofA is NOT among the safest countries in the world. Who knew? Fifth on our list is high-speed internet. It’s a big deal to us. Ecuador has it. Finally, climate. We do not do hot-and-humid well. Nor do we care for bone-chilling cold. Since Ecuador takes its name from the fact that it straddles the equator, one would expect it to have an equatorial climate. And it does. The western part of the country is on the Pacific coast; it is hot and humid. The eastern part is in the Amazon rain forest, which is also hot and humid. But between these two regions are the Andes Mountains, where you will find Cuenca situated at an altitude of 8,400 feet. It has what is called a subtropical highland climate. Average day time temperature is 58 degrees Fahrenheit, with day time highs in the low seventies and night time lows in the upper forties. It has two seasons: wet (January-May) and dry (June-December). Hmm … I wonder how deciduous trees know when to drop their leaves? There is one issue that I haven’t addressed yet: family. We don’t have a lot of family. I have a brother who lives outside Bellingham, WA, and we have a daughter who lives in Vancouver, BC with her husband and newborn son. The first thing to say about living far from them is that we can leverage technology to mitigate geographical distance. Mainly Facebook, Skype (or something similar) and regular flights home for visits. The second thing is that we don’t intend to be expats forever. We’re thinking in terms of maybe two years. What if we decide to continue living abroad beyond that? We’ll cross that bridge when we come to it, but I can imagine flying our grandson and his parents to whatever country we’re living in and giving him the cross-cultural experience of a lifetime. So there you have it. A grand new adventure to mark a grand new beginning for Trueda and me. We have no way of knowing where it will take us. We might discover early on that the expat life is not for us. Or that Cuenca is not for us, in which case we can always try Oaxaca, or some other location. Or maybe the fact that we are now grandparents will trump everything, and we’ll come skedaddling home. Or maybe we’ll divide our lives between Vancouver and points elsewhere, becoming expat nomads. Or maybe we’ll fall in love with some exotic location and never leave. Who knows? It’s a journey without a known destination. And we’re just fine with that. We created this blog for two reasons. First, to let our family and friends follow us as we launch out into the unknown. Second, to let others who might be considering a similar journey follow us and learn from our experiences. If you want to follow us, click the “Follow Us” button in the right-hand pane to sign up for an email notification whenever a new post is added to our blog. I would enjoy that. Let’s make it happen. Just remind me of your arrival dates and we will…love introducing folks to Popacuchu and their wonderful soups & pastries. 😉 I’ve heard from several that they had no issues with asthma in Cuenca (other than too much diesel fumes). We used Diamox for two days before departure and another two after arrival, really helped us. (Rx from US doctor). Drink lots of water, more than you think you need and rest the first couple of days. It’s easy to over exert. Looking forward to it!